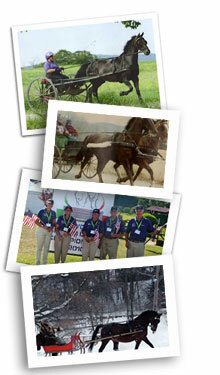 R & W Horsedrawn Services in Brownsville Vermont is owned and operated by Robin and Wilson Groves. Both have been training riders and drivers and their equines for the last 35 years and have been at their present location for almost 20 years. Currenty we are competiive in Combined Driving, Distance Driving, Pleasure Shows, and compete regularly up and down the east coast year round. Located in beautiful Brownsville in south central Vermont where there are miles of dirt roads ideal for conditioning and training. Just a few miles from the GMHA where members can enjoy the full size dressage areas, cross country jumps, marathon obstacles and many water crossings. GHMA offers a variety of horse shows in different disciplines at all levels and are on the calendar from April through October. Email ~ randwgroves@gmail.com ~ Copyright R&W Horse Drawn Services 2016. All rights reserved.